To make the cupcakes, preheat oven to 350 degrees fahrenheit. 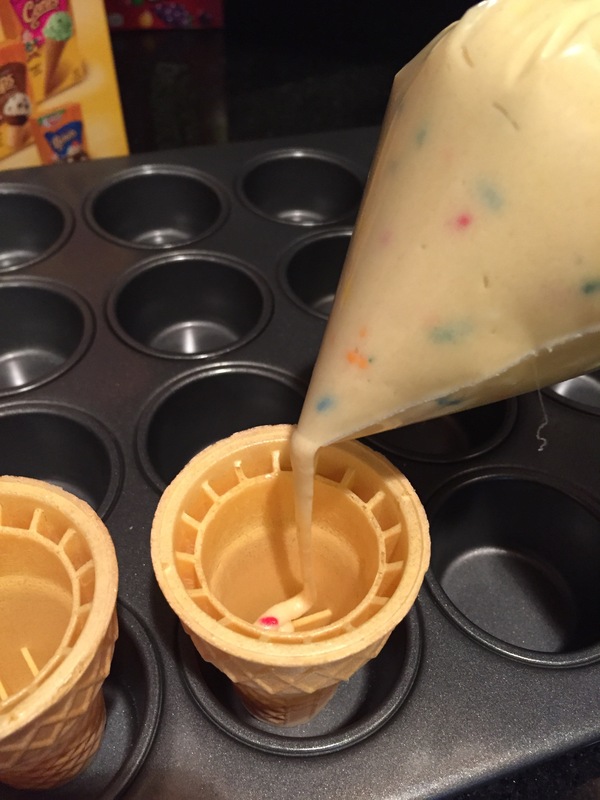 Stand about 20 ice cream cones up in a mini cupcake pan. In a bowl, whisk together the flour baking powder and salt. In another bowl, beat together butter and vanilla until creamy. Add eggs, one at a time and beat until well blended. Beat in sugar. Slowly add in flour mixture, alternating with the milk until everything is incorporated. Stir in the sprinkles. Now, you can either just spoon the batter into each ice cream cone, or use a pastry bag or ziplock bag (what I used) so you don’t make a mess. So cool, right? I like baking them like this. I’ve seen some people bake cupcakes and then just place them inside an ice cream cone but that’s cheating 😉 This, way, you have cake all the way down to the last bite. However, the cone did get soggy/chewy. I didn’t mind it but my husband was turned off. Now make the buttercream frosting. Beat butter until nice and creamy and smooth. Add in 2 cups of powdered sugar and vanilla and beat until you get a nice consistency. Add more sugar as needed. Pipe onto cooled cupcakes and decorate however you like! Have fun and enjoy!